Canary is the latest production by North East multi-disciplinary theatre collective Fun in the Oven. As their debut full-length production, the Newcastle-based company have relished creating this dynamic show – one which is at once ambitious, accessible and subversive. 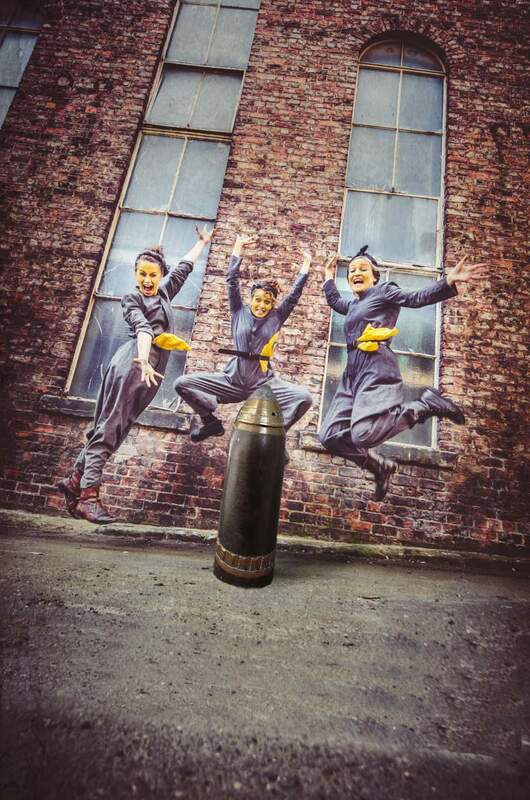 Set in the First World War, Canary focuses on the work of the Canary Girls, a motley crew of Munitionettes “doing their bit” for the war effort. These ordinary women were called to work directly with TNT. As a result, many had yellow skin from poisoning and jaundice, hence the bleakly comic namesake. Others had strange lumps in all sorts of places, some lost fingers and even their lives in factory accidents or in air raids from the Germans. “Canary was born from frustration at the lack of representation of women in history.” Explains Katie. We were fascinated. What were their lives like? So we decided to delve into the Tyne and Wear Archives and the Devil’s Porridge Museum in Gretna.What we found was truly incredible- diverse stories ranging from the tragic to the ridiculous. Some women would eat small amounts of cordite as it gave them a “hit” and made them work faster. Suddenly, women had their own money and raucous groups of women started hitting the pubs on a Friday night. They played football and wore shorts for the first time. New inventions including improved machinery and tools – they even invented the factory canteen! And so the seed for Canary was planted: an air raid on the canary girls’ shell shop rocks their world as they embark on a cordite-fuelled journey through euphoric emancipation, forbidden friendships and anarchic dreams. This play is not a museum piece, or a history lesson; it’s “a grotesque, surreal and comical trip through life in one of Britain’s shell shops.”. Throughout the month, Fun in the Oven will tour with Canary across the region, playing at Northern Stage on Friday 15th September – an accompanying workshop will also grant access to the archive material used in this production, exploring ways to create characters and stories. We’re expecting an inspirational, explosive and funny evening, as we’ve come to expect when any group of courageous women get together and set the world alight with their passion and determination! Canary will be playing at Northern Stage on Friday 15th September.